IBM® PowerHA™ for i (formerly known as HASM) is the IBM high availability disk-based clustering solution for the IBM i 6.1 operating system. PowerHA for i when combined with IBM i clustering technology delivers a complete high availability and disaster recovery solution for your business applications running in the IBM System i® environment. PowerHA for i enables you to support high-availability capabilities with either native disk storage or IBM DS8000™ or DS6000™ storage servers. * Part 1, "Introduction and Background" on page 1, provides a general introduction to clustering technology and some background. * Part 2, "PowerHA for i setup and user interfaces" on page 69, describes and explains the different interfaces that PowerHA for i has. It also describes the migration process to this product and some sizing guidelines. 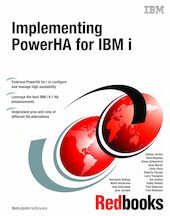 * Part 3, "Implementation examples using PowerHA for i" on page 319, explains how to use PowerHA for i with three major ERP solutions, such as SAP®, Lawson M3, and Oracle® JD Edwards®. * Part 4, "Other IBM i 6.1 high availability enhancements" on page 349, explains additional IBM i 6.1 announced enhancements in high availability.